Wired.com has published a feature about tongue-in-cheek gaming, adding a playful twist by turning the article into a game. In a feature called the curse of Cow Clicker : How a cheeky satire became a videogame hit, Wired.com reports on how a “cow-clicking game” (FarmVille), inspired another cow clicking game (Cow Clicker), by adding a cow clicking element to the feature – perhaps a first in digital storytelling. Every time a reader clicks on the word “cow” – repeated 97 times within the feature – a graphic of a cow appears, with the “cownter” keeping track of how many cows have been clicked on. The cows in fact obscure the text therefore making it more difficult to read the article. 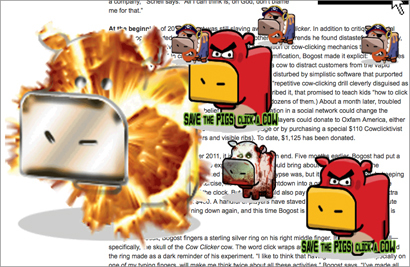 Readers can also click on the graphical cows to send them to their Facebook friends. The feature is intended to “echo the theme” of the Cow Clicker Facebook game discussed in the feature, Shannon Perkins editor of interactive technologies at Wired.com told Journalism.co.uk. “It’s an intentionally trivial experience obscuring a more content rich experience,” he said. Cow Clicker was created by Ian Bogost, a game developer, academic and co-author of Newsgames: Journalism at play. The game, which peaked at 56,000 players, was inspired by popular Facebook game FarmVille. The Wired.com featured includes an interview with Bogost. On one level, this was all part of the act. Bogost was inhabiting the persona of a manipulative game designer, and therefore it made sense to pull every dirty trick he could to make the game as sticky and addictive as possible. But as he grew into the role, he got a genuine thrill from his creation’s popularity. Instead of addressing a few hundred participants at a conference, he was sharing his perspective with tens of thousands of players, many of whom checked in several times a day. Shannon Perkins, editor of interactives at Wired.com, who is behind this interactive will be speaking on newsgames at news:rewired. Also presenting in the session is Bobby Schweizer, Ian Bogost’s co-author of Newsgames: Journalism at play. For a day of inspirational ideas in journalism sign up to attend news:rewired – media in motion. It is being held at MSN HQ, London on 3 February 2012. This entry was posted in Funny, Magazines, Multimedia and tagged interactives, newsgames, shannon perkins, wired.com on January 4, 2012 by Sarah Marshall. Magazine publisher Conde Nast has a new chief technology officer – whose first task will be to manage the expansion of the group’s publications, according to Wired.com. Conde Nast, which is the parent organisation of Wired.com, announced the arrival of Joe Simon, formerly chief technology officer at Viacom, yesterday. Wired.com says the new recruit will be faced with the job of extending the company’s portfolio onto multiple platforms. Periodicals of all stripes are staring down plenty of challenges these days, due to the massive proliferation of alternate entertainment and information options in these connected times. But they’re also faced with a major opportunity: to expand beyond the paper and website formats. The iPad is clearly a step forward in this regard, and looks fairly innovative now. But it’s by no means the final word on digital magazine publishing, according to Sauerberg, Jr., who hopes his new hire will expand the company’s reach potentially to dozens of further platforms. This entry was posted in Business, Magazines, Multimedia, Online Journalism and tagged Conde Nast, digital platforms, Magazines, multimedia, wired.com on August 5, 2010 by Rachel Bartlett. Leaked documents website Wikileaks is to auction off emails from a ‘top aide’ of Venezuelan president Hugo Chavez to the highest media bidder. The site is experimenting with the auction as a new revenue model. The successful bidder will receive embargoed access to the messages, which will later be made publicly available by the site. This entry was posted in Editors' pick, Online Journalism and tagged aide, Hugo Chavez, media bidder, President, Venezuela, wiki, Wikileaks, wired.com on August 28, 2008 by Laura Oliver.